Teams become more effective when they collaborate well. But how do you create an environment that makes it safe to collaborate, where people trust they’ll be heard and valued? Sara Ness has amazing experience creating collaborative, effective and inspiring teams and will show you! Are you leading or participating in teams at work? Or perhaps with family or friend group dynamics? Team work is part of many aspects of our lives. I imagine you’ve had moments where being on a team has felt challenging! As our last podcast showed, dealing with people is often the hardest part of business and life! Companies are focusing more on collaboration these days because it works. Gone are the days of the lone wolf. Teams are proving to be more effective! What may be surprising is that teams are having to become more “human” and relational as we find that leaving your heart at home, pretending to be robotic at the office, is not good for your or for productivity, motivation or innovation. 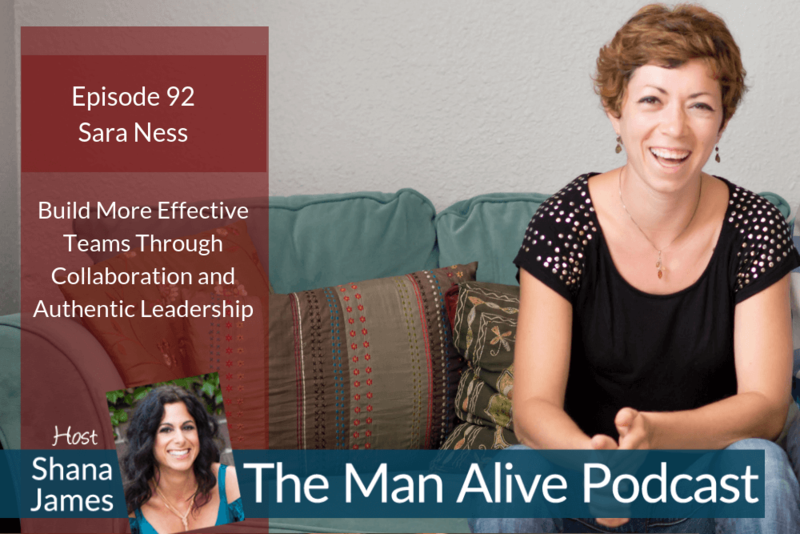 On today’s Man Alive podcast I was joined by Sara Ness. Sara has coached more than 500 leaders in sectors ranging from education to the Coast Guard, on the art of empathetic leadership. She is the founder and Chief Instigator at Authentic Revolution. She’s young and she’s whip smart! Also, I’d love to know what you want support with these days. As the Man Alive community grows men have a variety of careers and relationships. Will you take a minute (seriously that’s all this survey will take) to let me know what you want and need most these days? Let me know here. Sara is a creator and facilitator, founder of a thousands-strong learning community in Austin, Texas and instigator of many other groups worldwide. She is passionate about exposing the joy of human connection and exploring our creative potential through relationship. She has coached more than 500 leaders in sectors ranging from education to the Coast Guard on the art of empathetic leadership, and is Founder, Whole-Holder and Chief Instigator at Authentic Revolution.